Like a ticking time bomb, each year we see more devastation to the world’s bee colonies. Originally called colony collapse disorder, the cause of a decline in bees is now widely attributed to the use and overuse of agrochemicals, specifically neonicotinoids, a family of pesticides used in many parts of the world as one of many mass-produced chemicals developed to be less toxic to mammals and birds. 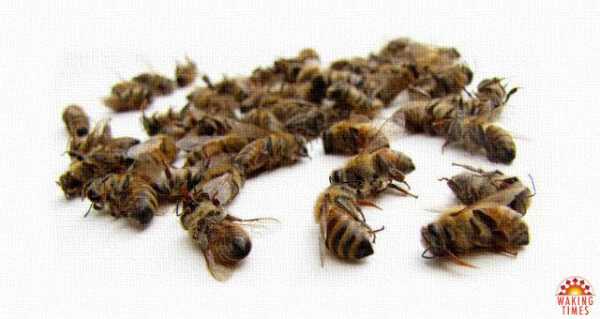 All too frequently we hear reports of thousands or even millions of bees found dead in one place or another. Last year, millions of bees died in Southeastern U.S. as a result of mass spraying of the insecticide naled against mosquitoes as a method of addressing the Zika outbreak. In 2015, the USDA found that America’s honeybee populations had decreased by a shocking 42% over the prior year. Again it was bad news in 2016, as the rusty patch bumble bee (Bombus affinis) was formally proposed for the endangered species list, a move seen as a last hope for survival for threatened animals. The loss of bees and other pollinator insects is one of many burgeoning ecological crises which threaten the future of life on planet earth, and now, the rusty patch bumble bee has officially been added to the endangered species list by U.S. Fish and Wildlife Services. This is the first bumble bee to be protected under the endangered species act. “Just 20 years ago, the rusty patched bumble bee was a common sight, so ordinary that it went almost unnoticed as it moved from flower to flower, collecting nectar and pollen. But the species, now balancing precariously on the brink of extinction, has become the first-ever bumble bee in the United States — and the first bee of any kind in the contiguous 48 states — to be declared endangered. So, once again, now in 2017, more warning signs appear. Something is unsteady in the ecosystems which sustain us, and until news like this becomes the top daily priority of news organizations around the world, the human race will be unable to properly address this crisis. “Grow flowers, including flowering trees and shrubs. Have a mix with something in bloom from early spring through fall. Include native milkweeds for monarch butterflies. Bumble bees and many other pollinators (bees, moths and butterflies) need a safe place to build their nests and overwinter. Leave some areas of your yard unmowed in summer and unraked in fall, in your garden and flower beds leave some standing plant stems in winter. The example of a small but dedicated group of indigenous women in the Yucatan peninsula in Mexico may serve as inspiration for those who wish to make a positive contribution. In the following video, group founder and president Anselma Chale Euan explains how a group of 20 local women has come to be a global example of how ordinary people can contribute to the monumental task of stewarding a future for the honeybee. Their co-op works primarily with the stingless bee, Melipona Beechi, a species that was traditionally cultivated by men during the ancient times of the Mayan empire. Their work has been a learning process but they have developed their hives and have come to care for over 20,000 bees, producing over 48 liters of honey a year. This article (North American Bumble Bee Officially Added to Endangered Species List) was originally created and published by Waking Times and is published here under a Creative Commons license with attribution to AlexPietrowski and WakingTimes.com. It may be re-posted freely with proper attribution, author bio, and this copyright statement.